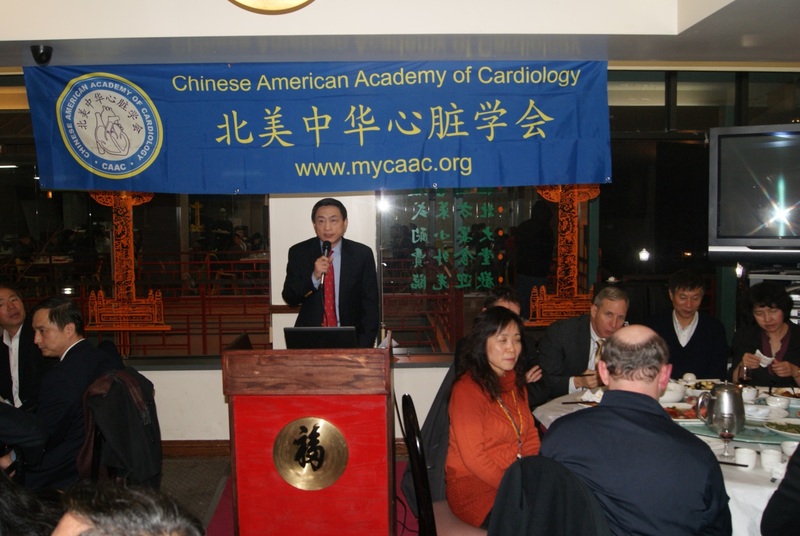 CAAC President (Research) Dr. Hong Wang is co-hosting the CAAC-AHA14 Scientific Symposium. 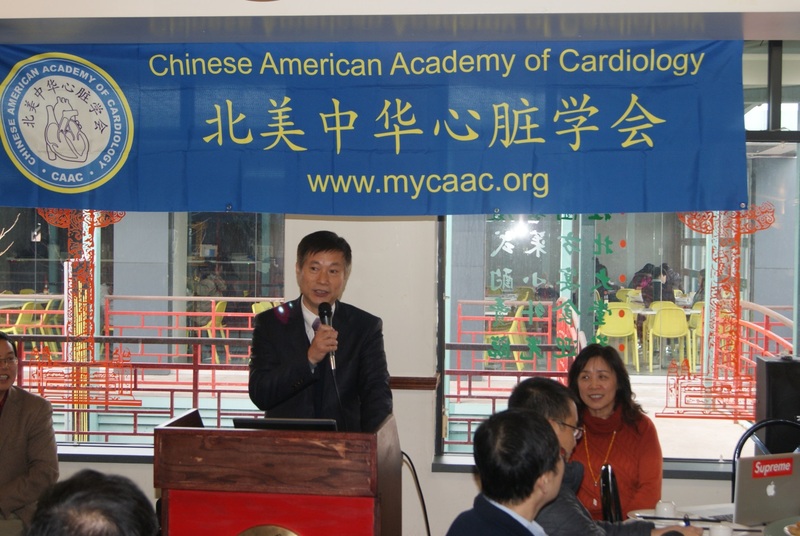 Dr. 顾东风 (Dong-Feng Gu, Vice President of FuWai Hospital) speaks at the CAAC-AHA14 Symposium. Drs. 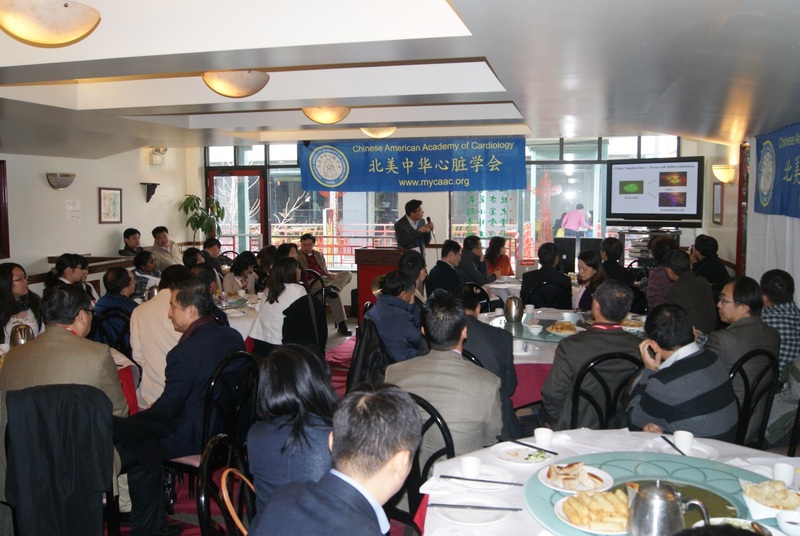 David Hsi, 马长生 (Chang-Sheng Ma，Beijing AnZhen Hospital), and Hong Wang. 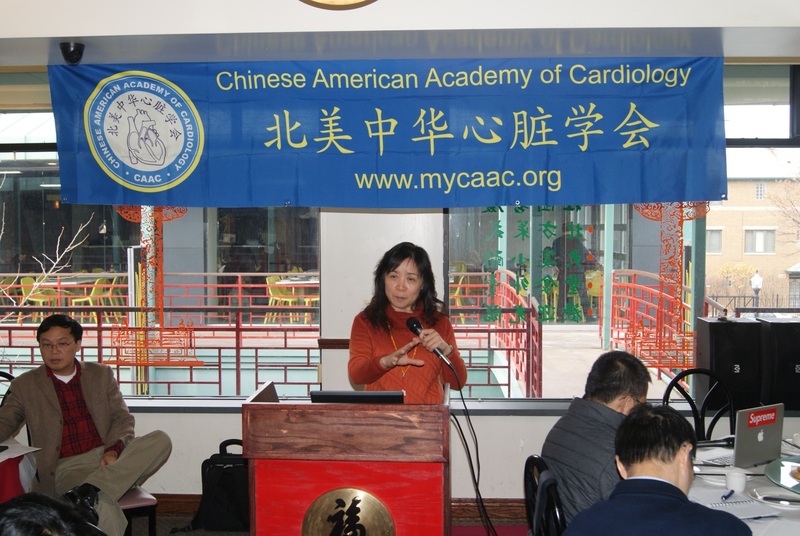 Dr. 王宪（Xian Wang, Vice-Principal of Peking University Health Science Center）speaks at the CAAC-AHA14 scientific symposium. 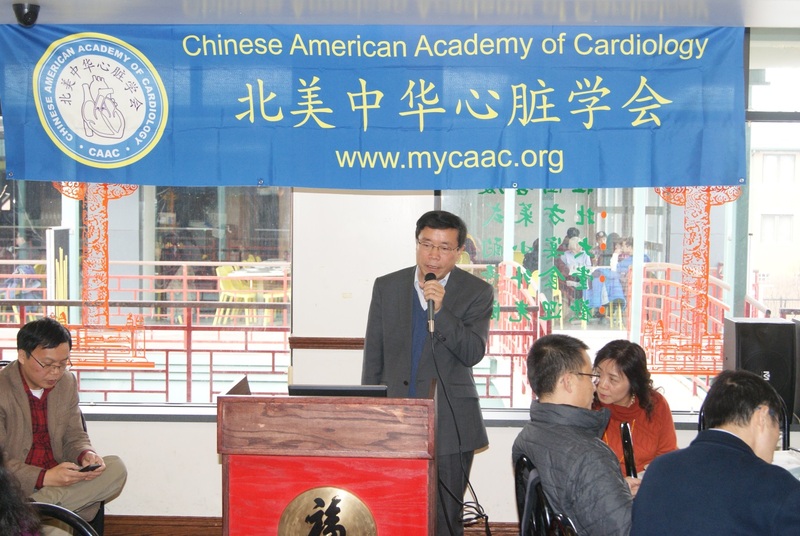 Dr. Qingbo Xu, (BHF John Parker Chair of Cardiovascular Science, King’s College Londo, UK) speaks at the CAAC-AHA14 scientific symposium. Drs. 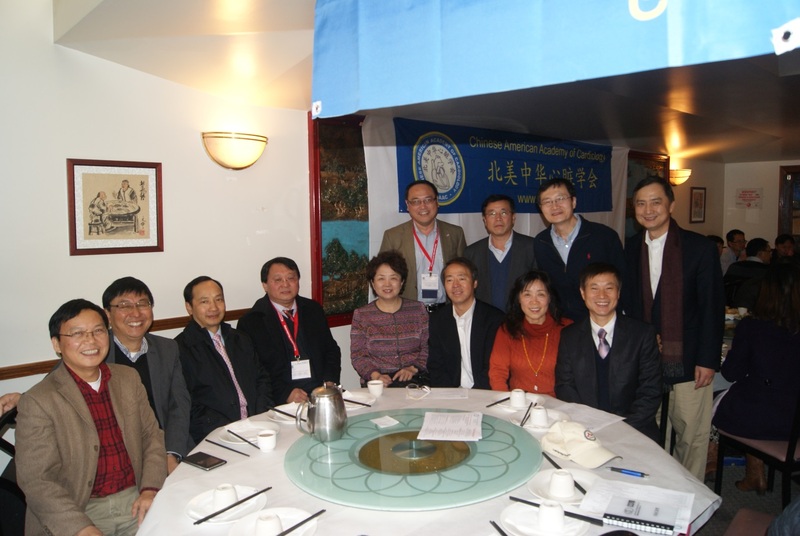 Shuping Ge, 惠汝太 (Rutai Hui，Vice President of FuWai Hospital), Hong Wang，何奔（Ben He， Shanghai JiaoTong University），Chen Yan and 徐清波(QingBo Xu, London , UK), etc. 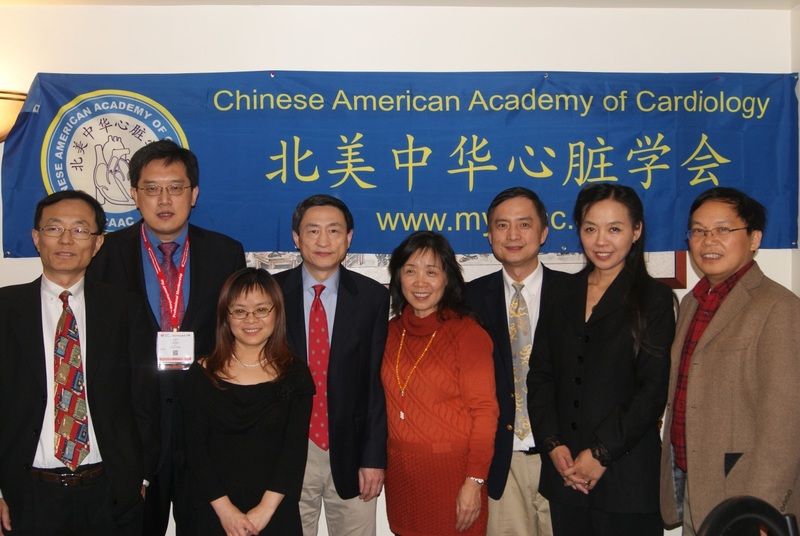 CAAC leadership and guests (from left): Drs. Eugene Chen, Xinliang Ma, 马长生 （Changsheng Ma）, 田野 （Ye Tian, Harbin Medical University）王宪(Xiang Wang, Peking University), Xinli Wang, Tianxin Yang, Qingbo Xu, Hong Wang, Xiao-feng Yang, 顾东风 (Dongfeng Gu, FuWai Hospital), and Shuping Ge, etc. 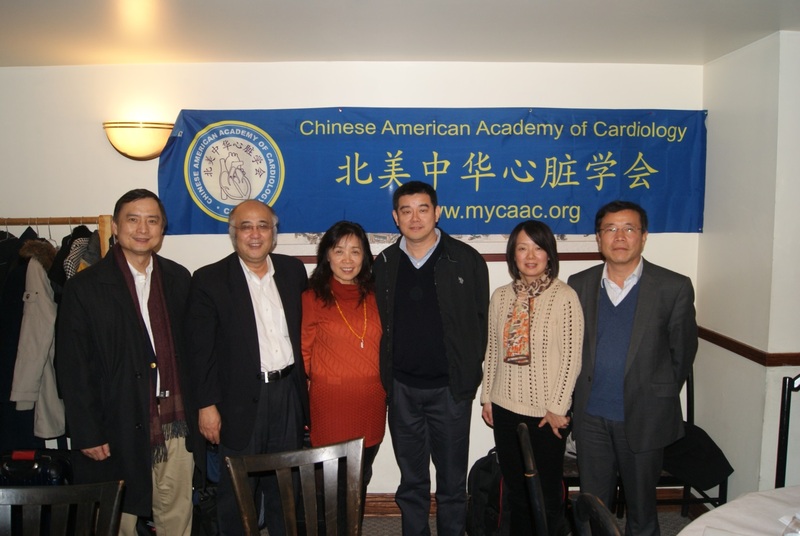 CAAC leadership and guests (from left): Mr. Peng Yan, Drs. Xinliang Ma, 马长生 （Changsheng Ma, Beijing AnZhen Hospital）and 田野 （Ye Tian, Harbin Medical University）. 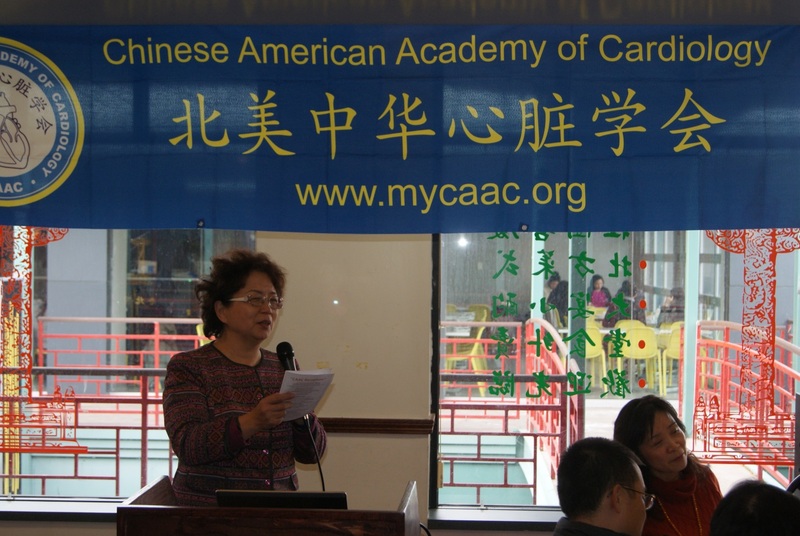 CAAC leadership (from left): Drs. David His, Shuping Ge, and Hong Wang. 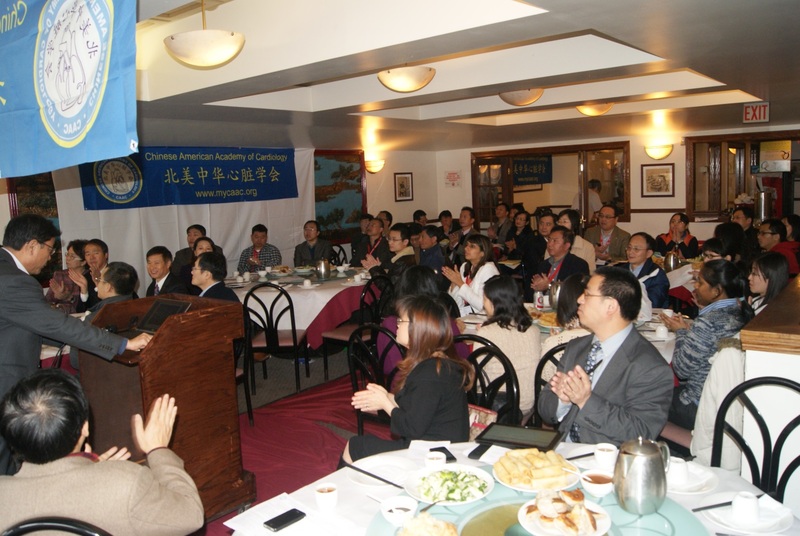 CAAC leadership (from left): Drs. 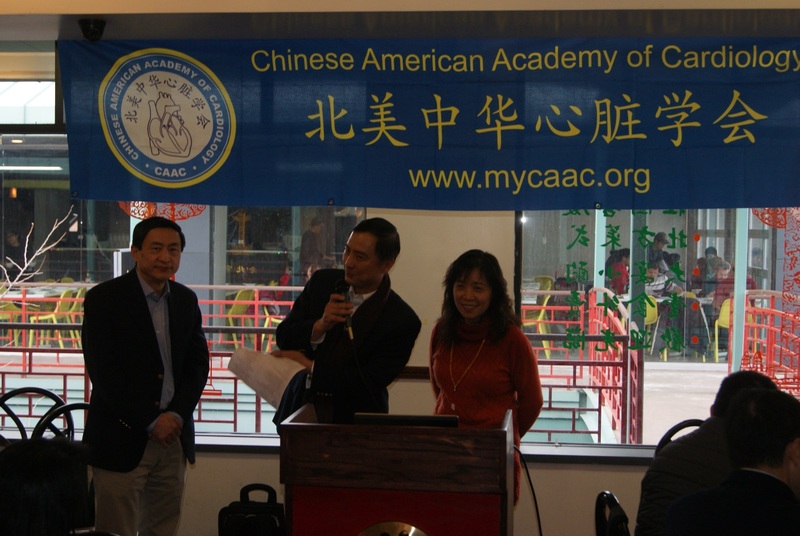 Hong Wang, Minghui Zou, and Eugene Chen at CAAC-AHA14 Symposium. 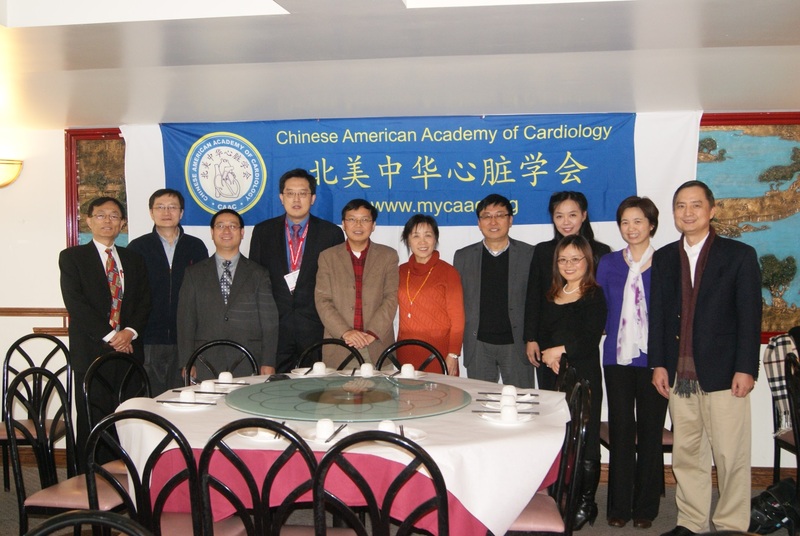 CAAC leadership and guests (from left): Ms. Grace Fu, Drs. Qiong (Joan) Zhao, Minghui Zou, Shuping Ge, Hong Wang, David Hsi, Liwen Tang, Eugene Chen, Xinliang Ma, Lei Xiao, Songcang Chen, Mr. Peng Yan, and Dr. 田野（Ye Tian）. 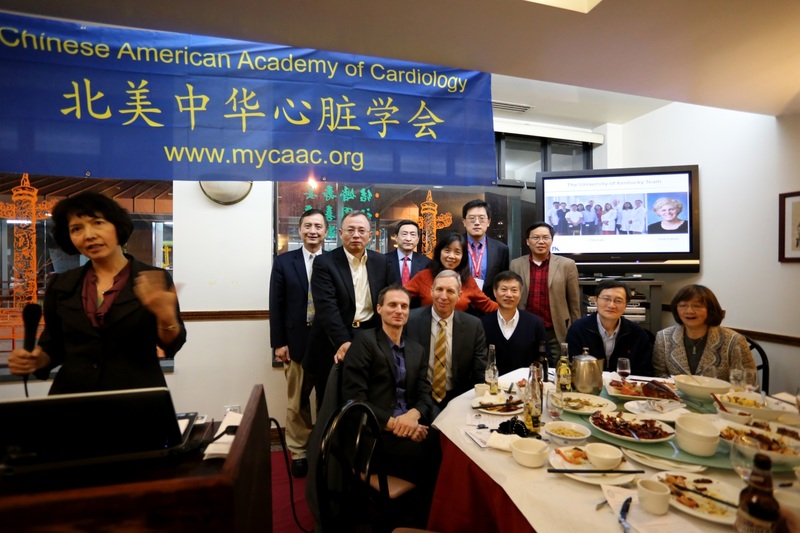 CAAC leadership and Young Investigators Award (YIA) hosts (from left) Drs. 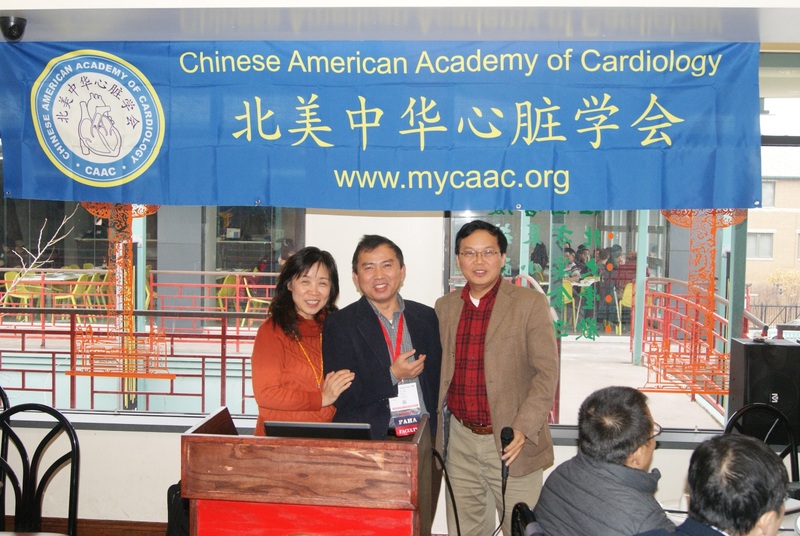 Qiong (Joan) Zhao, Liwen Tang, Xiongwen Chen (Co-chair of CAAC-AHA14 Scientific Symposium). 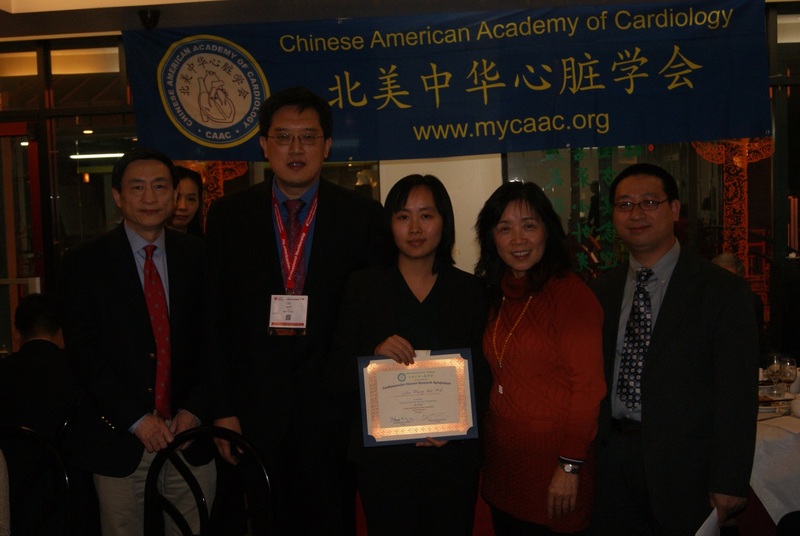 CAAC-YIA First Place Awardee and CAAC leadership (from left): Drs. 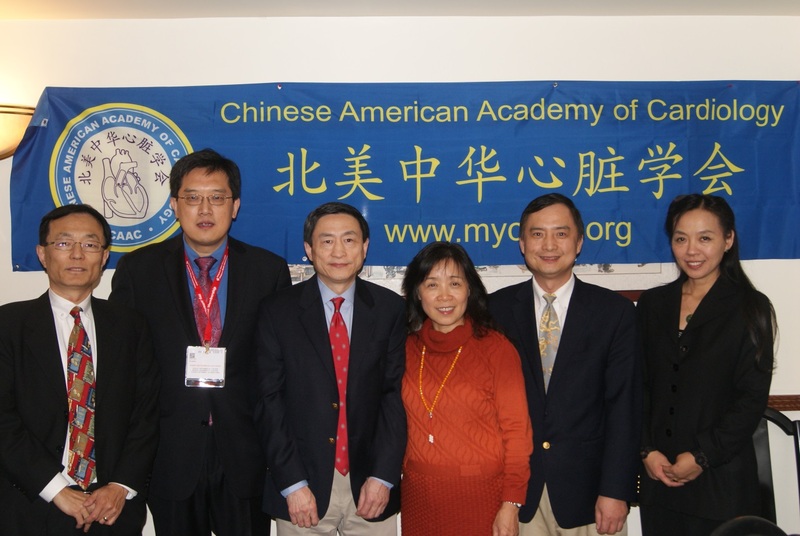 David Hsi, Qiong (Joan) Zhao, Lei Xiao, Shu Meng (1st Place CAAC-AHA YIA Awardee), Hong Wang and Xiongwen Chen. 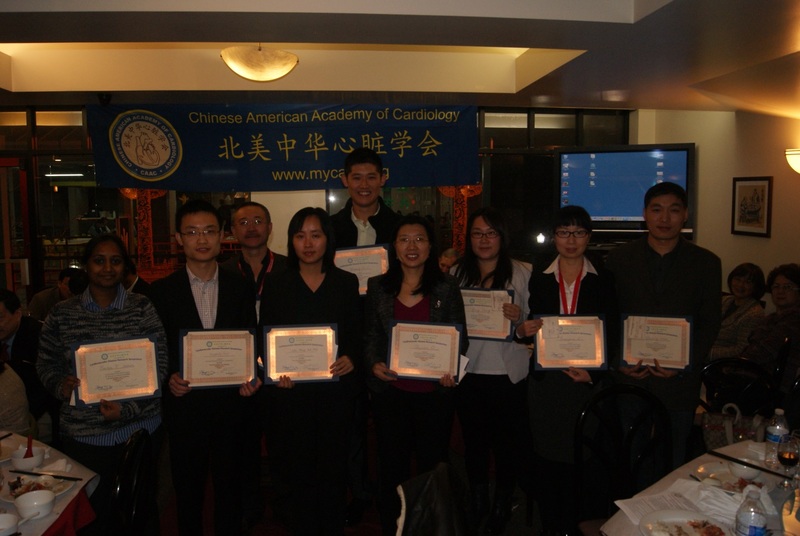 The winners of Young Investigators Award (YIA) of CAAC-AHA14 Scientific Symposium on 11-15-2014. 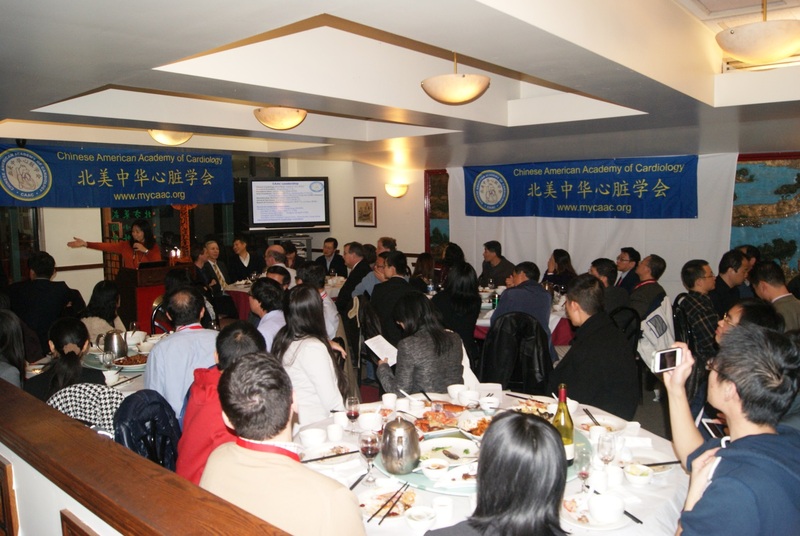 CAAC President (Clinical) Dr. David Hsi is giving the open remarks at the CAAC-AHA14 dinner reception. 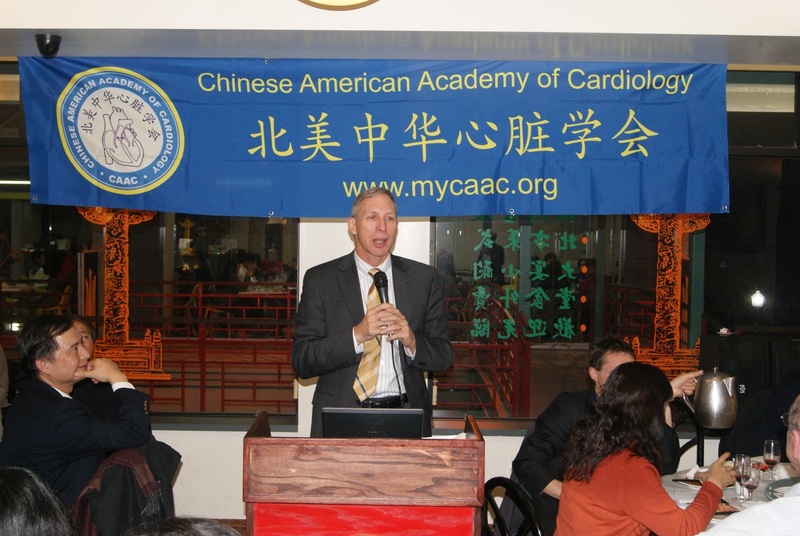 Dr. Steven Lentz, Chair-elected of AHA Council on ATVB, speaks at the CAAC-AHA14 dinner reception. 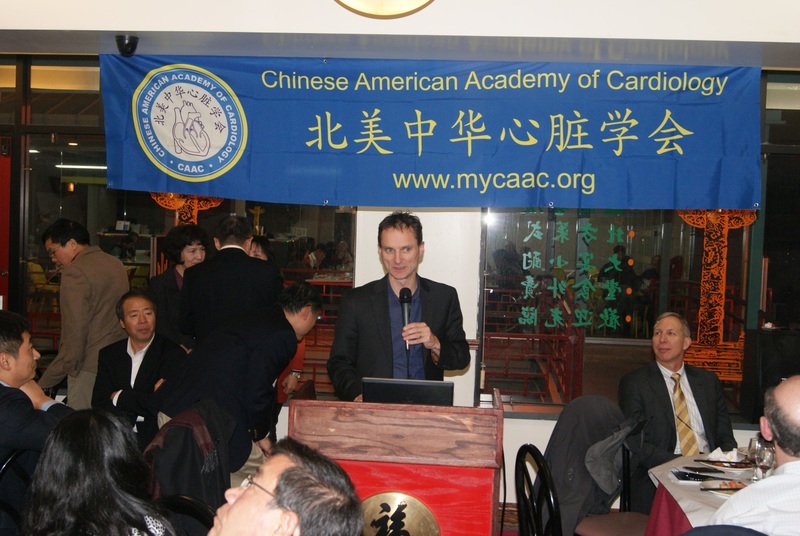 Dr. Muredach Reilly, Chair of ATVB Scientific Session program committee, speaks at the CAAC-AHA14 dinner reception. 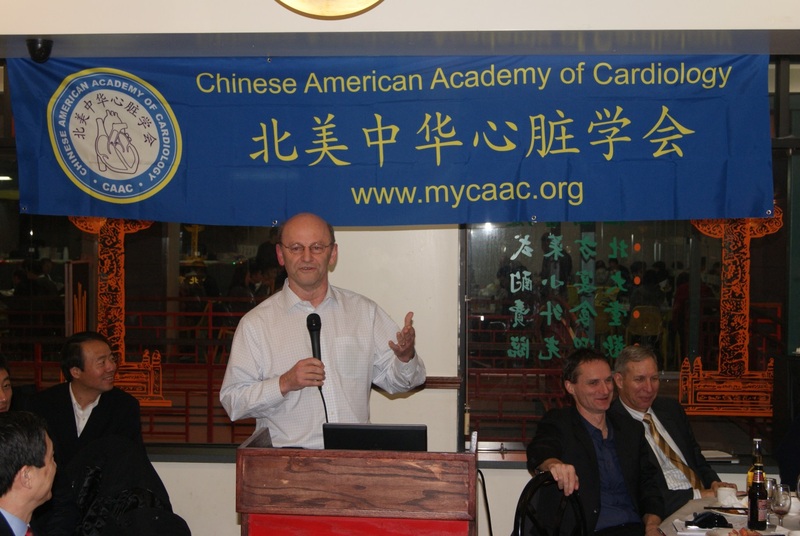 Dr. Alan Doughty, Senior Associate Dean of Research at the University of Kentucky; Immediate past Chair of ATVB Council; ATVB Editor-in-chief, delivered the keynote speech at the CAAC-AHA14 dinner reception. 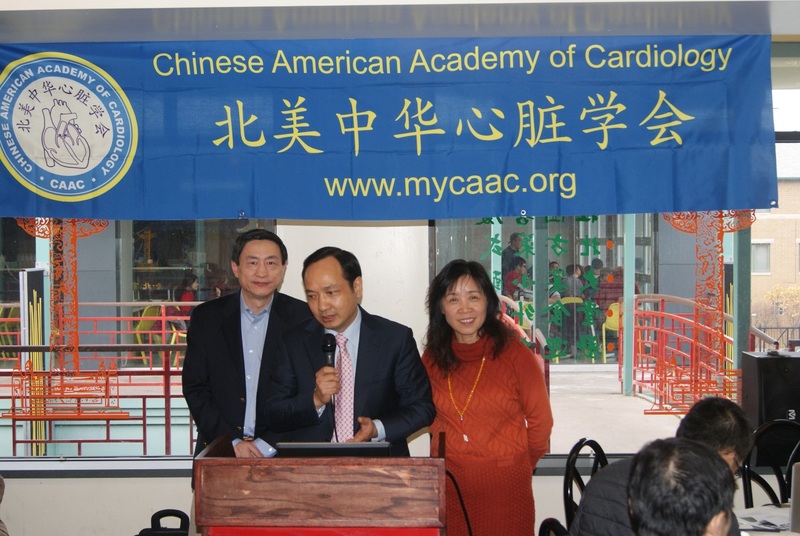 CAAC leadership (from left): Mr. Peng Yan, Drs. Lei Xiao, Liwen Tang, David Hsi, Hong Wang, Shuping Ge, Qiong (Joan) Zhao, and Eugene Chen. 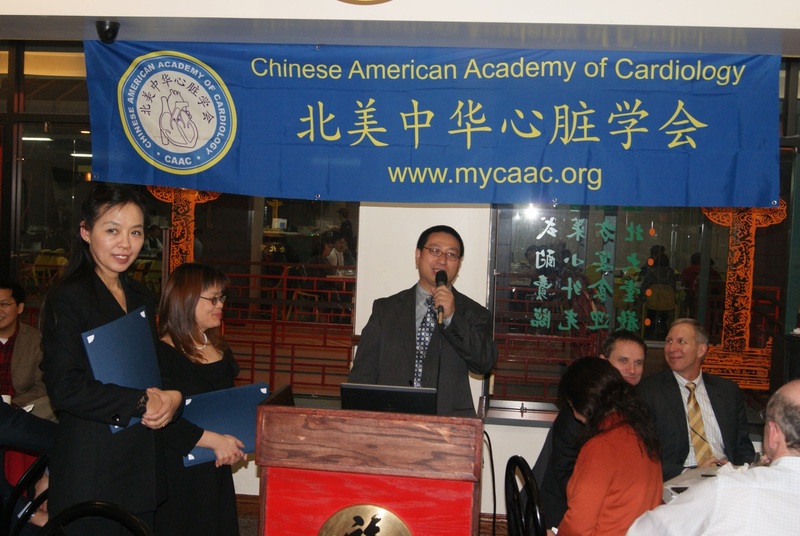 CAAC leadership (from left): Mr. Peng Yan, Drs. Xiao-Feng Yang, Xiongwen Chen, Lei Xiao, Eugene Chen, Hong Wang, Xinliang Ma, Qiong (Joan) Zhao, Liwen Tang, Ying Ge, and Shuping Ge. 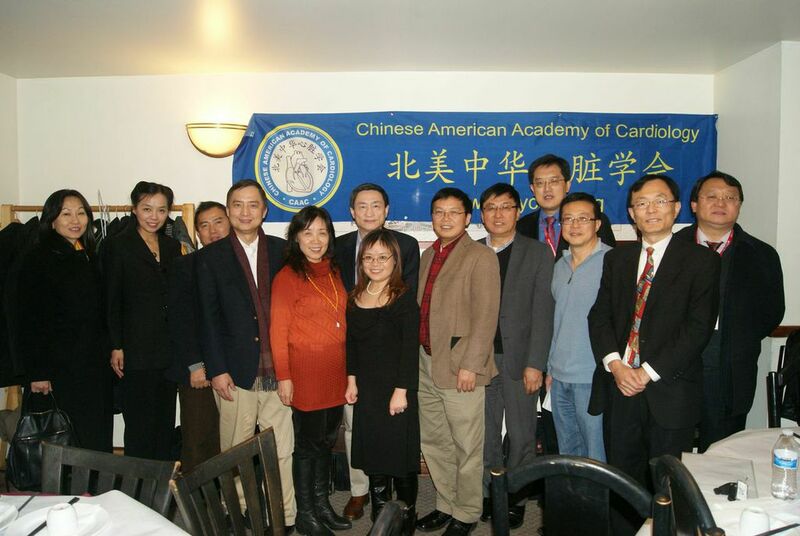 CAAC Board of Trustees (BOT) members at CAAC-AHA14 event (from left): Mr. Peng Yan, Drs. Lei Xiao, David Hsi, Hong Wang, Shuping Ge, and Qiong (Joan) Zhao. 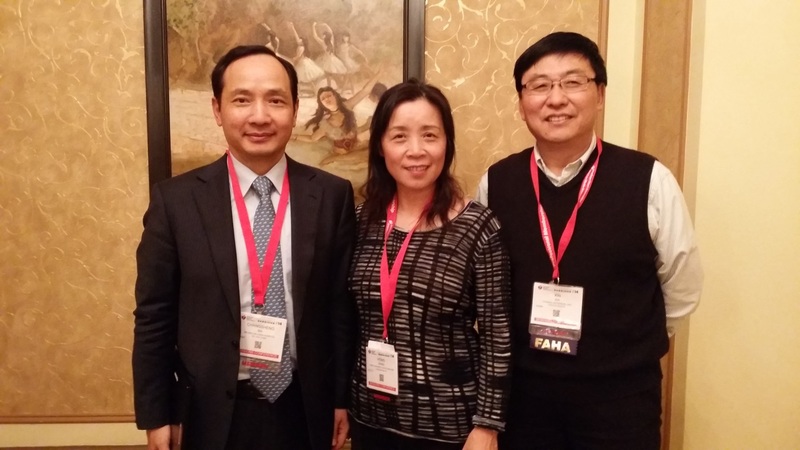 CAAC leadership and guests at the AHA 2014 Scientific Sessions in Chicago IL (from left): Drs. 徐希平 (Xiping Xu, Southern Medical University), Eugene Chen, 王宪 (Xian Wang, Peking University), Hong Wang, and 田野 (Ye Tian, Harbin Medical University). 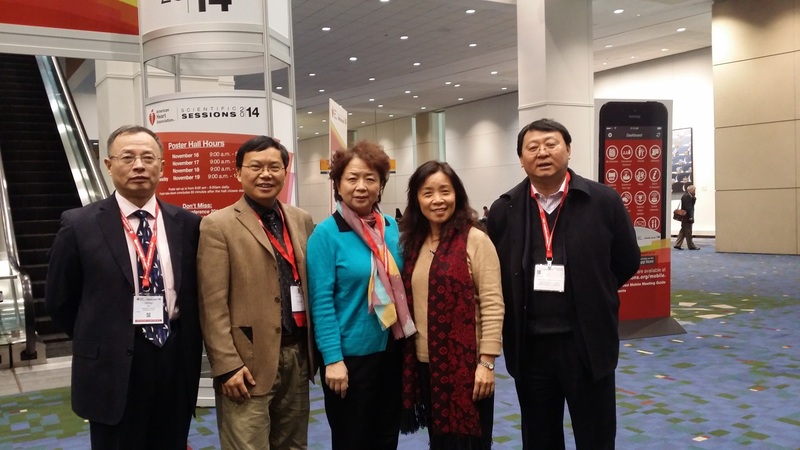 CAAC leadership and guest at the AHA 2014 Scientific Sessions in Chicago IL (from left): Drs. 马长生 (Changsheng Ma, Beijing Anzhen Hospital), Hong Wang, and Xinliang Ma. 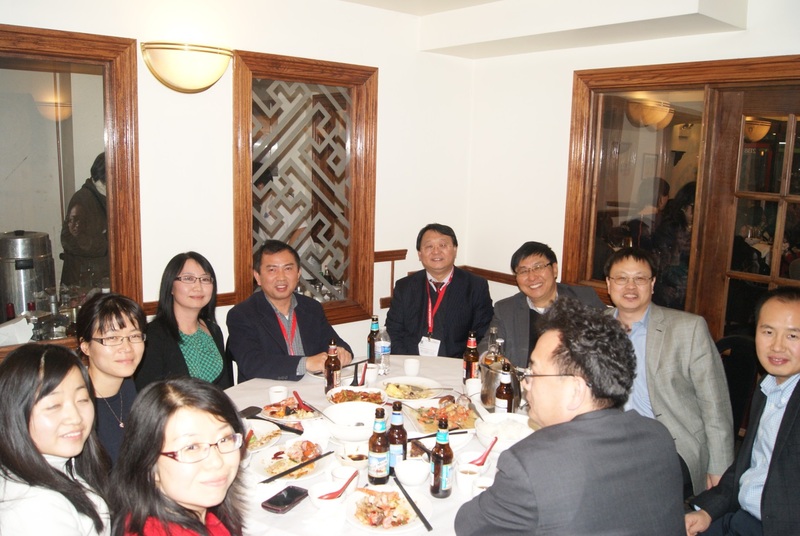 CAAC leadership and guests at the CAAC-AHA14 dinner reception (from left): Drs. 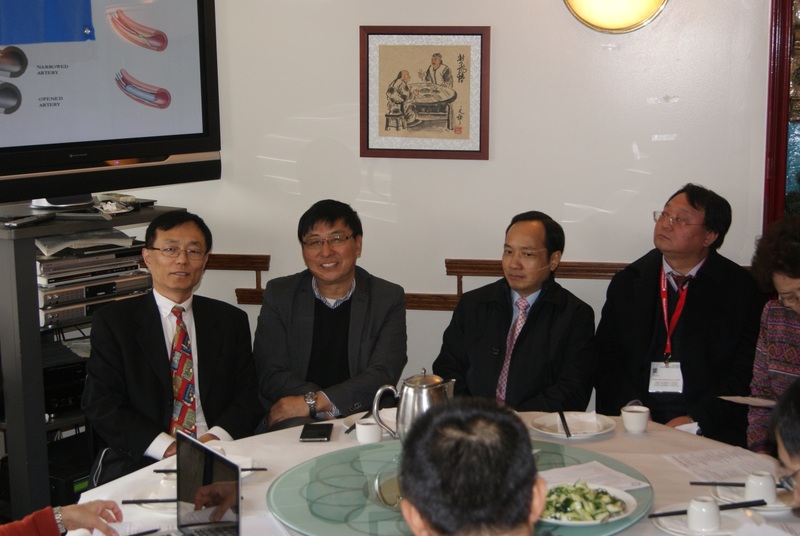 Xiaobin Wang (speaker), Shuping Ge, 徐希平 (Xiping Xu, Southern Medical University), Muredach Reilly, David Hsi, Steven Lentz, Hong Wang, Lei Xiao, 顾东风 (Dong-Feng Gu, Vice President of FuWai Hospital), Eugene Chen, Xiao-feng Yang, and Pin-Lan Li.